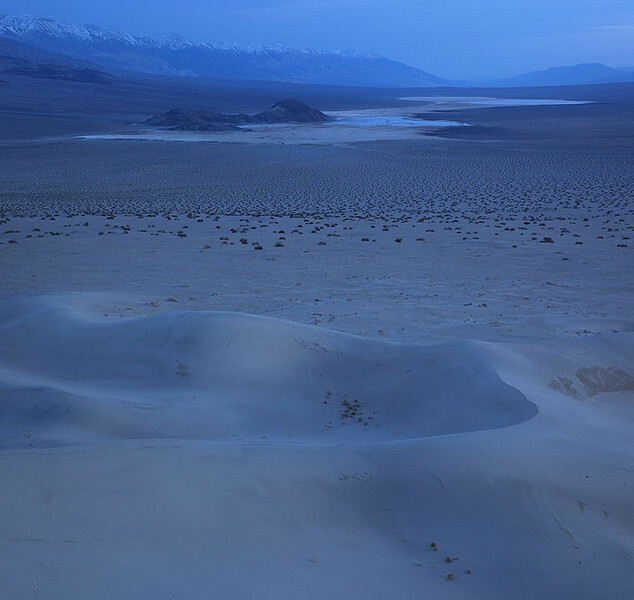 The Panamint Dunes are the most remote set of large dunes in the park. They are also the least visited set of dunes in the park. It’s about a 4 mile one way hike and most of the hike is relatively moderate until you reach the sand and uphill on sand begins. You’ll begin to move a little slower this way. A high clearance vehicle is recommended for the dirt road to access the dunes north of highway 190 in the Panamint Valley. The turn off is easy to miss but it’s a few miles east of Panamint Springs and you can easily find it on a park map. At the end of the road there is a small parking area. From here you walk across the alluvial fan towards the dunes, there is somewhat of a foot path but no trail so keep in mind the angle of where you parked the car. A compass should help you find your car if it gets dark and you can’t make out the mountains near telescope peak. What I liked about this hike, for the most part you walk through mostly creosote the whole way you’ll end up smelling like the Mojave Desert when you get back. On the dunes instead of human footprints you’re more likely to find lots of animal patterns and birds landing on the dunes to eat a bug or two, maybe even a few birds of prey. I’ve seen a golden or two in my travels here. You’ll also encounter a few fly byes of F-18’s from China Lake if you’re lucky. More so during the week, they’ve had control of the airspace before Death Valley was a National Park or Monument so we have to share the skies with them. Best of all you can enjoy one of the off the beaten path places in park with another view of Telescope Peak off in the distance. Snow on the peak give the scene a beautiful contrast to vastly open desert below. This entry was posted on January 10, 2012 at 10:42 am and is filed under Uncategorized. You can follow any responses to this entry through the RSS 2.0 feed. You can leave a response, or trackback from your own site. Excellent! I hope to attend one of your workshops here one year. Jay, thanks for stopping by. I know you and your backpacking hikes a lot attitude would love this set of dunes! I can get you somewhere good. Neat! I usually don’t like seeing people in landscape images (including my own stuff!) but in this case, the top image is made better and we are able to get a sense of perspective. Thanks for sharing, makes me want to visit!! What a special place these dunes. Deserted, magnificent and beautiful. 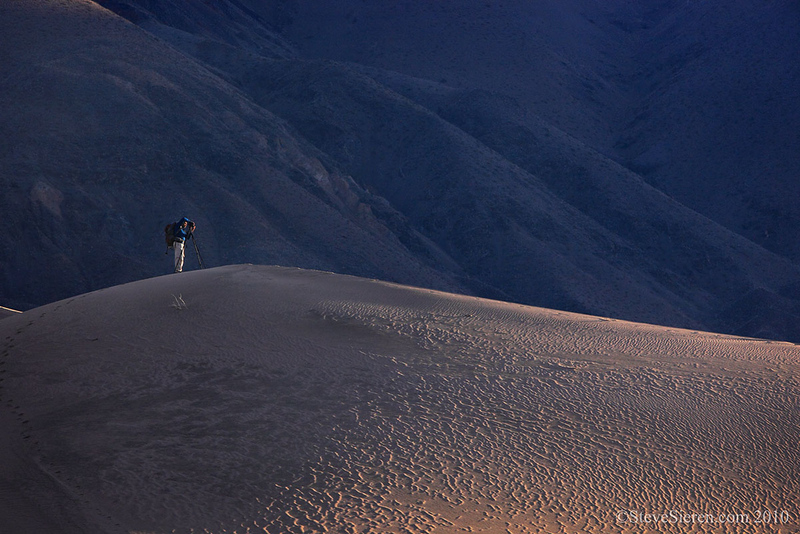 Panamint Valley is a special place and hiking to these dunes is a great way to enjoy it. Oh, I so like the first shot, Steve. Wonderfully done, it makes me want to see what the photographer is seeing. Beautiful use of light in the first photo – the contrast with the mountains in the background is striking. The cool white balance in the second photo really adds to the feeling of isolation, as well. Thank you Logan, lots of isolation out there! I was surprised at how little area at Death Valley is covered by sand dunes. We visited the easy access dunes just east of Stovepipe Wells. Sand Dunes – Death Valley Campout March 2005. Hey BRTomas, you caught a great bloom! Not everyone gets to see that in Death Valley. It’s not the Sahara but you can still walk far enough to regret the hike back. Looks like you enjoyed your time there! as i plan to start my research project about analysis character based on photo profile and photo cover facebook, may i get your permission to use your death vally photo as photo cover of my fb page project (with your name on it)? because your photo have verry positive feeling and full of hope. I’ll verry glad if you give me the permission..